Edwards had held a lofty notion of self-regard as the “joy” of consent to being, including consent to one’s own being, in contrast to definitions of self-regard in clearly self-interested terms. He was convinced on empirical grounds that the will always seeks the happiness of the agent such that the notion of selfless love is an abstraction divorced from concrete human experience. Also, God is the exemplar of perfect happiness who shares this aspect of himself with the saints. Consequently, love of one’s own happiness is not eradicated by Christianity. 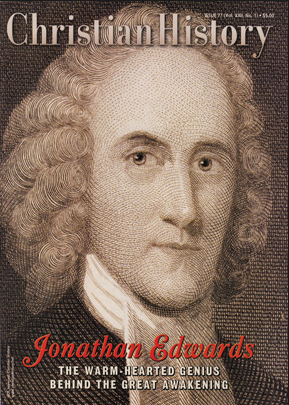 Edwards’ was influenced by his maternal grandfather, Solomon Stoddard, an orthodox Puritan. in his suspicion of the radical renunciation of the natural inclination of the self towards personal happiness. He was also influenced by Samuel Willard’s lectures: “God having put into a man a natural desire after happiness or well-being, makes use of it to help him in his duty. Willard concluded that God deals with man in a way that is suited to his nature. For Willard, Stoddard, and Edwards, the renunciation of all self-regard claimed by some as the highest reach of Christian love made little sense. If Christianity did indeed tend to destroy man’s love for himself, and to his own happiness, it would threaten to destroy the very spirit of humanity. … That the saint seeks happiness is as necessary to his own nature as the faculty of the will is; and it is impossible that such a love should be destroyed in any other way than by destroying his being. Edwards reconciliation of Christian love with self-regard emerges from the empirical observations regarding the will. Every being that has understanding and will, he wrote, necessarily loves happiness. In Edwards mind, the desire for happiness is a brute empirical fact, and one that any doctrine of love must take into account. Men love to be loved by others and without any connotations that such love is sub-Christiaan. It was Edwards conviction that what could be empirically ascertained accords with scriptural warrant. Finally, Edwards maintained that the saint shares in the happiness of God. During his own early conversion experiences, he noted the “sweetness” and the “joys” of being touched by the Holy Spirit. In his writing’s on the Trinity, he argued that God the Father experiences supreme joy in mutual relation with the Son, such that abundant happiness pours out from the Godhead and fills the hearts of the saints. * The above selected comments were taken from -“Disinterested Benevolence: An American Debate Over The Nature of Christian Love” by Stephen Post. Source: The Journal of Religious Ethics. Vol 14. No 2(Fall 1986). pp. 356-368. .